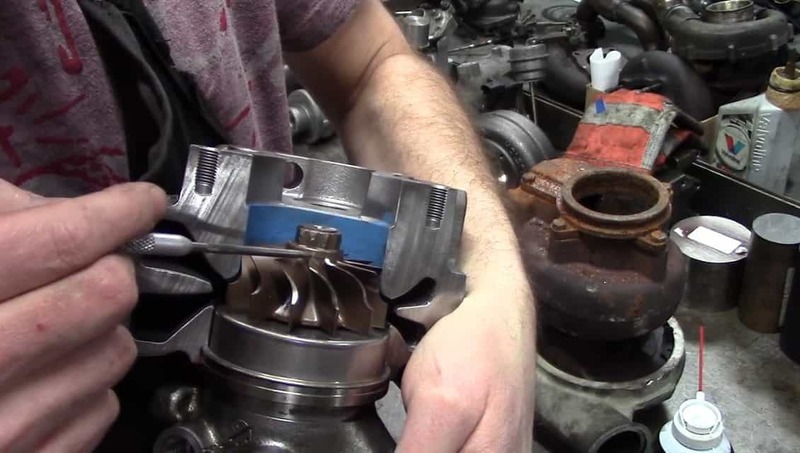 Taking apart a rusty turbo? Be careful, it is very easy to damage the turbine or housing. 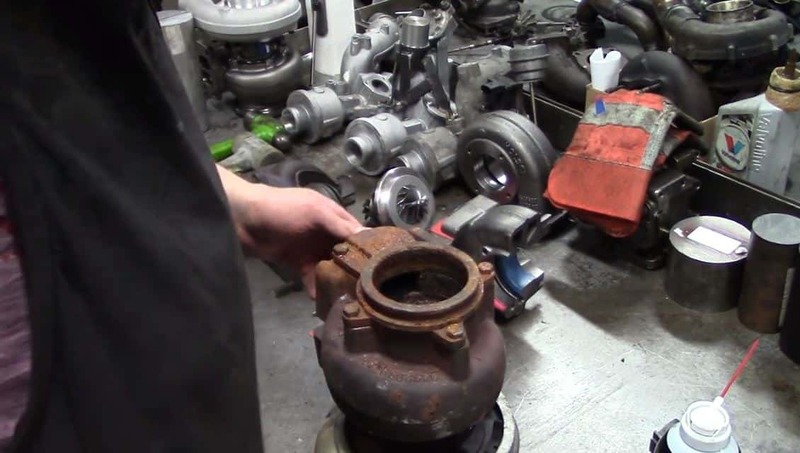 Our video shows how we disassemble a turbocharger without damaging the fragile parts within. 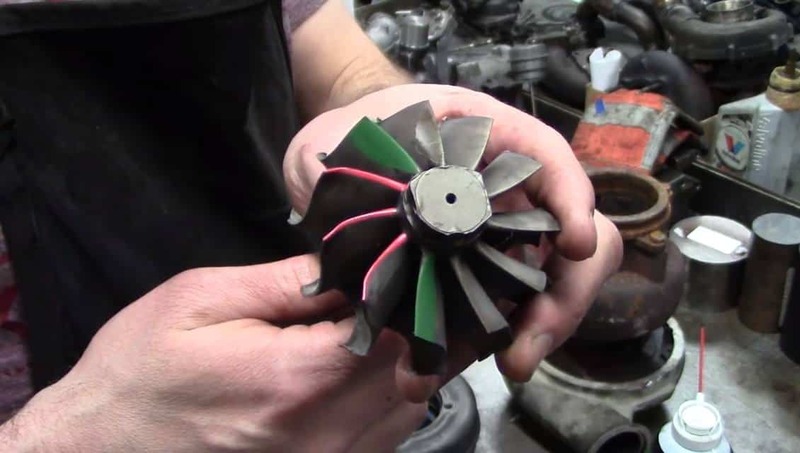 We can repair your turbo safely and properly, click here to contact us for assistance. Hey guys. 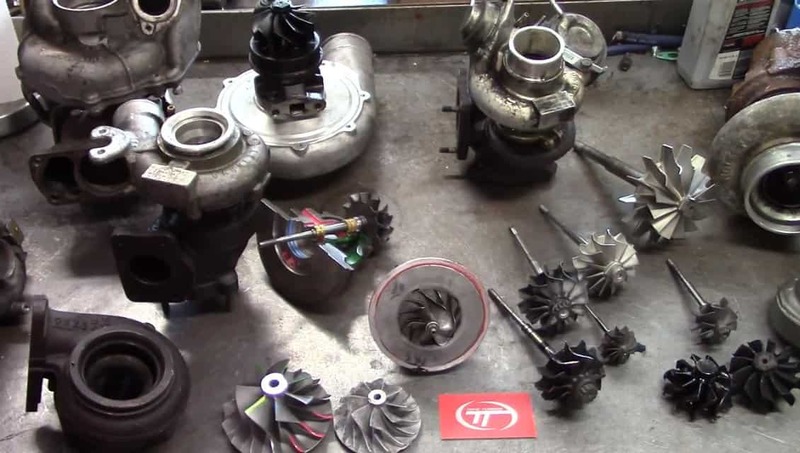 Welcome back to Tim’s Turbos. 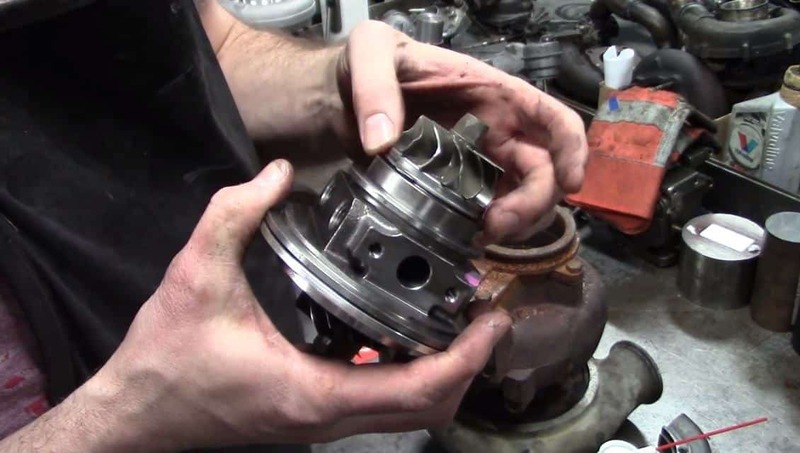 I want to go over a few things on how to remove a turbine housing properly so you don’t end up with a damaged turbine wheel or damaged turbine housing. The first thing that comes off when you see a turbine housing that’s been contacted from a bad removal is you will have these blade tips that are bent up. If you’re buying stuff and you see these blades bent, it’s usually a good idea to walk away from the thing because it’s going to be a paperweight. 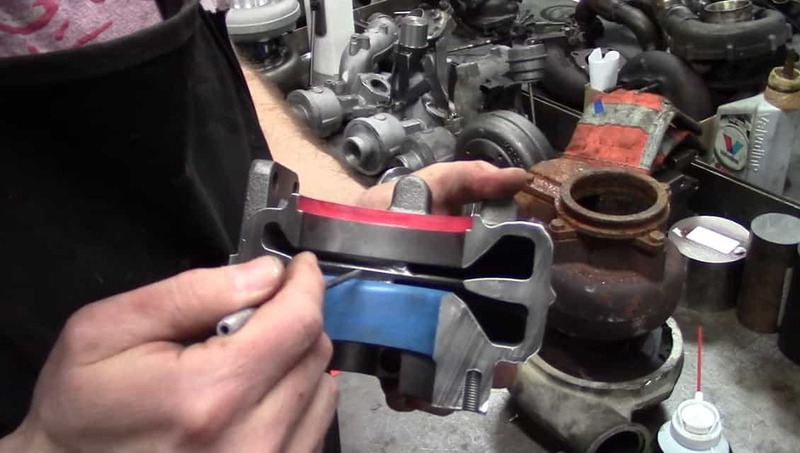 First off, in the last blog we did I showed you how to split a turbine housing with a bandsaw. This one we got a cut in half. I want to go over a couple of spots that really get most of the contamination going on. Right here is the bearing pocket and the heat shield is going to sit on that lip. Right here is the whole area where the heat shield is going to be. That gets a lot of condensation in there and it can hold on to it. Right here is obviously the diffuser. These are the exhaust gas passes. That’s where everything goes into the inducer of the turbine wheel, goes around the contour, and out the exducer of the turbine wheel. We’ll go over that stuff another time. What we’re trying to do here is show you where most of the stuff is sticking on the turbine housing itself. If you can see closely here, right here and here are where the bearing pocket sticks and so you’re going to be spraying a lot of penetrating oil here and a lot into the heat shield itself. Nothing actually gets to the heat shield from that end, so the best thing to do is flip the turbocharger upside down and you want to spray right around the hub because it’ll seep down and go and then get right on top of the heat shield and get in-between the turbine housing and heat shield. 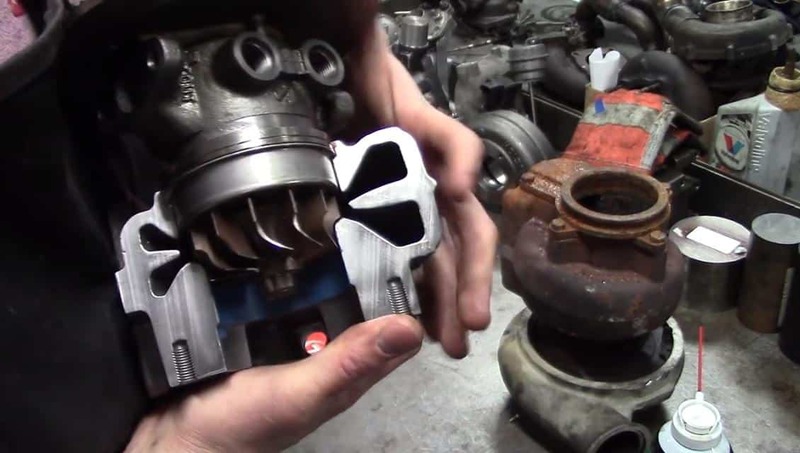 A lot of the time you can have a turbo that feels loose like this and it’s spinning – what’s happening is the heat shield is stuck in there. 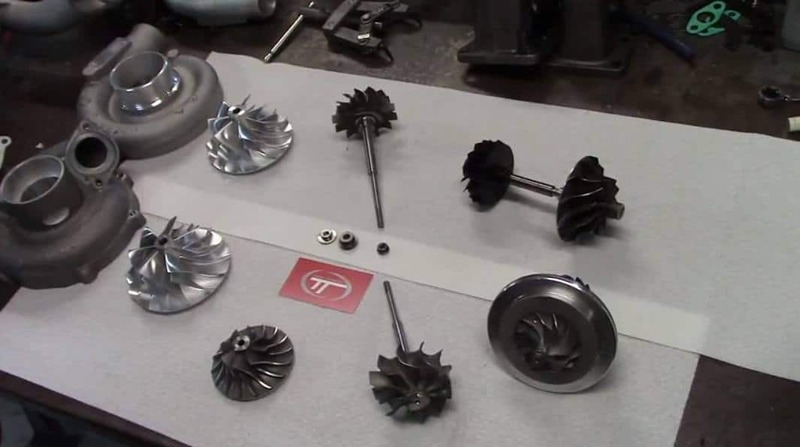 If you hammer on that turbine wheel you will damage everything in the turbocharger. So first things first, get yourself a rusty turbo. 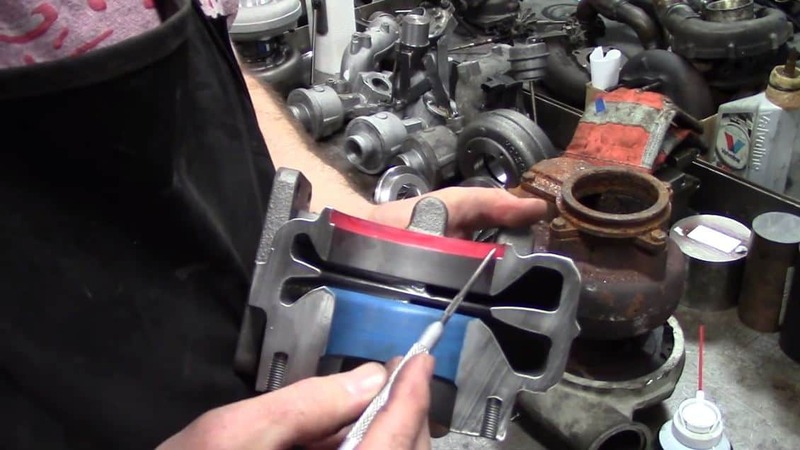 Like I said before, spray down the hub, get yourself one of the best tools out there: a liquid wrench. I use In-Force since it seems to work the best for me. You spray everything around that hub and let it soak hours, days, however long it takes upside down – just leave it on a table because it’ll sit in a pool and it’ll penetrate the best. After you’ve done that for a while, you’re gonna have to rip out all these bolts. Usually, you end up with two bolts that are gonna be the most stubborn. 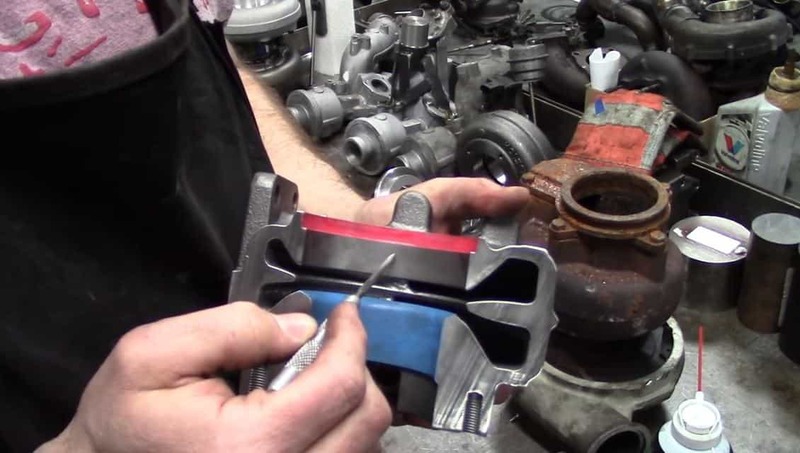 You can’t get the box-in wrench on them because it’s got the oil inlet and the oil outlet on each side. What you really want to do with that is if you can get the bolts to loosen up just a little bit, you want to be able to pull them out maybe three or four threads till they start to hit the oil flanges That’s fine because you can leave those clamps on there because when you hammer it off, you don’t want that turbine housing to fall off and scrape the turbine wheel and also smash your toes. If you get them to the loose point, that’s all you really need to do. (3) for most of the big stuff, I’m going to use a hard-face dead blow hammer. The way I do it there’s no magic tool except for the hammer. Prop the compressor on your stomach right. Where the X is, you’re gonna go at 12 o’clock and 6 o’clock. Wear gloves because you will hit your hands. You’re gonna get the other side to smack it again. Don’t hammer on the flange; you will mushroom it and will never seal until you get a flat file and clean it. You want to keep doing this every 180 degrees until the turbine housing falls off. Each time you hit it, it’s very critical to make sure that the turbine shaft can still rotate because if it rotates improperly and hits the side, you’ll bend the head and damage it. If you hit it once and it’s stops, just move back 180 degrees and smack it again. Usually, that’s going to loosen it up if the turbine housing is moving. That’s basically how you pull those off. You can get some of the other units like the K04s, K03s, and stuff. They have a little bit different way of pressing the bearing housing in there. They have a long sleeve that goes in. You can see that on the bearing housing here. The heat shield is front-face pressed in instead, so it doesn’t come up here. This is just bare steel on steel, so they’re going to hang in there a lot. I usually use a soft hammer for those because for some reason you just make a little bit better harmonic when are you trying to pop them out and they seem to work the best. Almost always you’re going to need to use the blowtorch on that kind of stuff, that way you don’t damage the parts. So hope this helps out. If you’ve got bent wheels and stuff like that, send them in to the shop and we can fix them for you. 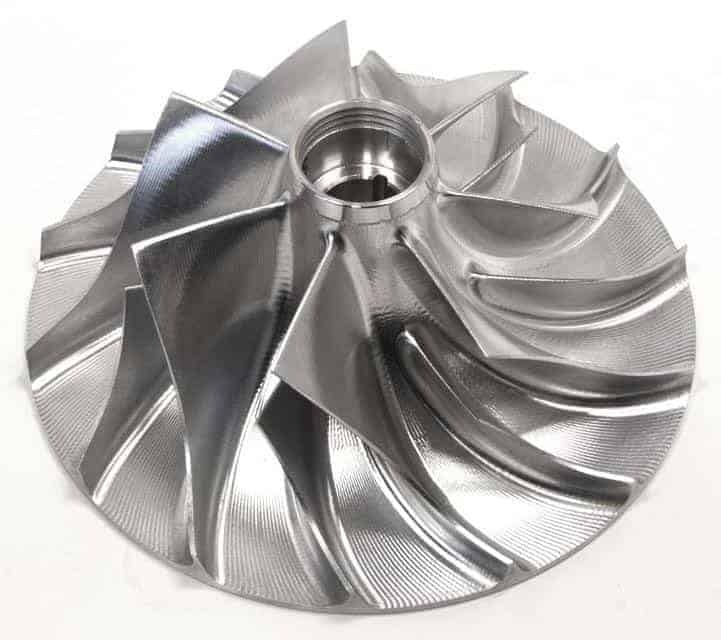 Are Brand-New Turbo Parts Balanced?